The GP2 series was introduced in 2005 and followed the Int. FIA F3000 championship which formed the final step on the ladder to F1 until 2004. The one-make Dallara chassis, using grund effects, in combination with a 4.0 litre V8 Mecachrome engine, a hydraulic operated semi-automatic gearbox and carbon brakes, proved to be a giant step forwad in terms of performance compared with the F3000. 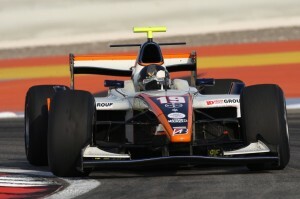 The GP2/05 chassis served for 3 years before it was used for another 3 seasons in the GP2 Asia series. In 2008 the GP2/08 car was introduced, which looked closer to F1 designwise, but was a slight step backwards in terms of performance. The new GP2/11 chassis introdued this year followed F1 in terms of aero – treatment and looks and seems to be on the performance level of the GP2/05 car again. Zele-Racing has a couple of GP2/05 cars, maintained to the highest possible standards, available for racing, testing or purchase. Both, chassis 029 and 031, were built in 2006 (ex Trident Racing) and have completed 1 year less racing mileage than any other GP2/05 chassis on the market. There are several onboard videos of our cars available on youtube. Please contact us, if you wish to test or race on of the bespoke chassis.